Dance clubs are a big part of the SL experience. They are the places that people meet and discover new friends. They are the place long time friends can dedicate time each week to drop what they are doing and hang out with friends from around the world. You click the dance ball, leave your avatar to do their moves and kickback while engaging in chat. It’s something that hasn’t really changed in SL after all these years. 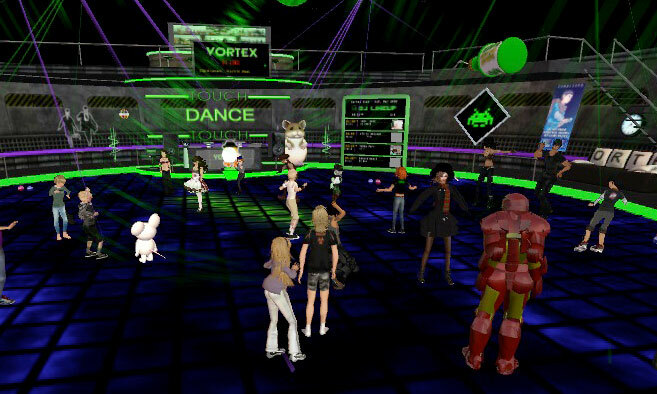 At the start of this year my SL brother entertained the idea of rebuilding the Vortex dance Club again. For those who don’t know, the Vortex is one of the oldest clubs in SL. First opened in 2006, it has gone through four iterations and for the fifth i decided to help my bro in designing something that used all the latest building features, from mesh to materials and projector lighting. Beginning work on it back before the SL11B Cake Stage, it of course i started as a small idea, but..well.. you should know me by now…. The new V5 Vortex will open on Monday the 22nd of September with a line up of DJ’s and live performers starting at 9am SLT to 6pm SLT. One of the longest-running clubs in SL, The Vortex Club hosts a collection of devoted DJ’s who play new, classic and eclectic tunes. Check out @vortexclub on Twitter for more info, including DJ schedules. The 4th Anniversary of Escapades Island ROCKED!